· calibration and review of measuring equipment. During 2004. the Technical Test Center has performed recertification of established quality system in accordance with the ISO 9001:2001 standard. On the basis of the new edition of ISO 9001:2008 standard, recertification is planned during the 2010. Expanding its activities in the field of conformity assessment of products, in 2005 Technical Test Center has formed accredited laboratory for testing - Centre for testing products and Certification body for certification of products. On 7th March 2008 The Accreditation Board of Serbia awarded us with Accreditation of control organization in accordance with the SRPS ISO 17020:2002 standard. Department of Metrology, in accordance with the SRPS ISO/IEC 17025:2006 standard, acquired the status of accredited calibration laboratory. Jugoregistar - Serbian Ships Registry has issued confirmation of the testing organization acknowledgement to Technical Test Center in 28.12.2007. On the basis of technical competence of the Technical Test Center for conducting the review and testing work equipment for the Ministry of Defense of the Republic of Serbia has got a license (the number of solutions 164-02-00003/2008-01 26.05.2008.) for conducting these activities. 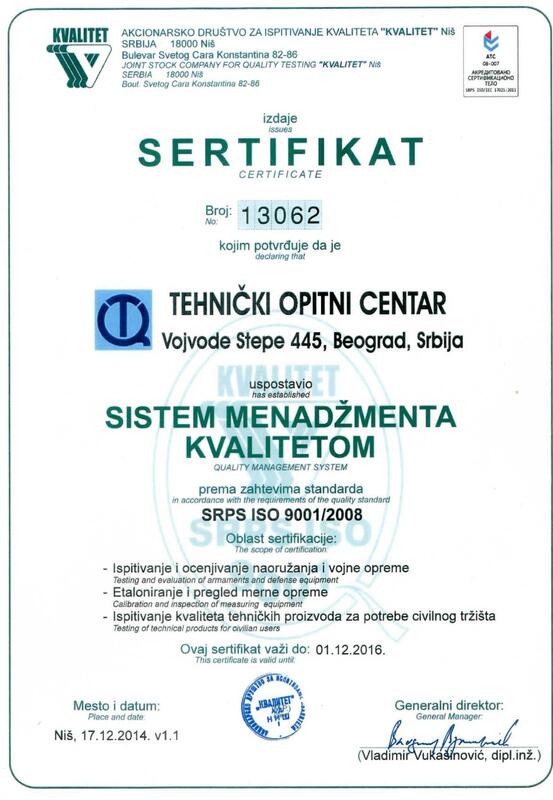 On 11.11.2005., Technical Test Center received authorization from the Serbian Institute for Standardization, to homologation testing and homologation conformity testing control of vehicles in relation to electromagnetic compatibility. - Testing and measurement in the process of technical inspection of radio stations.